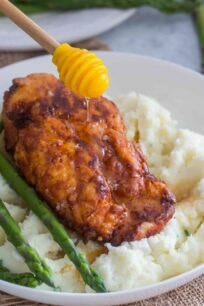 Healthy Honey Lemon Chicken is one of the fastest, most delicious and flavorful dinners you can make in 30 minutes! Not fried and with no processed sugar! 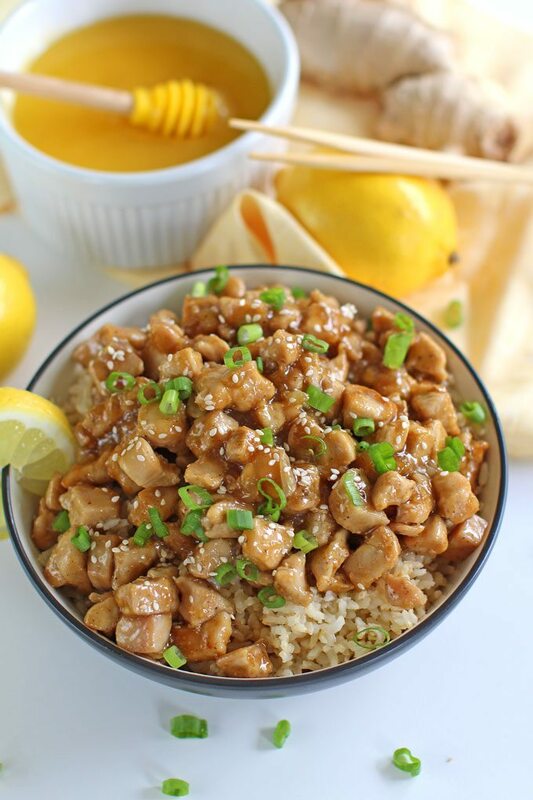 Healthy Honey Lemon Chicken is so much better than takeout! This recipe is super easy and quick to make, and also doesn’t involved any deep fried chicken or processed sugar. I love my fair share of indulgent recipes, but I also like to balance it and eat healthy. Healthy Honey Lemon Chicken served over brown rice is one of those crowd pleasing meals that I always refer to on a busy weeknight. Honey Lemon Chicken Lettuce Wraps – You can see that I love the honey lemon flavor. 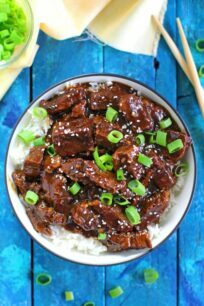 Instant Pot Mongolian Chicken – easy breezy, made is minutes in the Instant Pot. 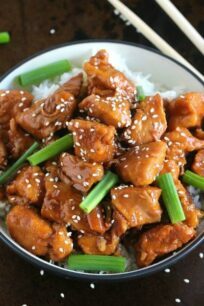 Crispy Ginger Sesame Chicken – a very easy and flavorful meal. 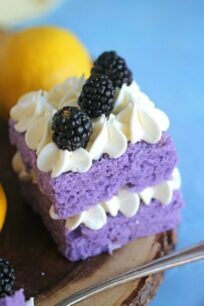 Also, cornstarch is a key ingredient in here, do not try to replace it with flour, the results will not be the same. I am a huge garlic lover, you can add more or less as you please, but in my case, more garlic is always better. In addition, fresh lemon zest will add a punch of favor so definitely add some and please don’t skip it. You can serve this meal with white or brown rice. 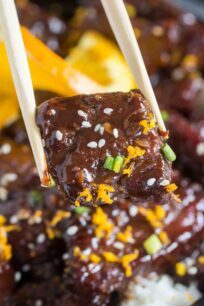 Garnishing the dish with sesame seeds and green onions will add a pop of color and interesting texture. In a medium saucepan add rice and to 2 1/2 cups of boiling water, cook rice according to package instructions; set aside when ready. Season chicken with salt and pepper add it to the skillet, cook until golden, stirring and tossing occasionally, about 4-5 minutes. Remove skillet from heat and set aside. Add chicken broth, orange juice, lemon juice, lemon zest, honey, soy sauce, vinegar, ginger, garlic and cornstarch to a medium sauce pan over medium heat, stir to combine. When adding the cornstarch is best to make a slurry to avoid clumps. Mix it with the orange juice in a small bowl and after that add it to the sauce pan. Bring to a boil, reduce heat and simmer until slightly thickened, stirring from time to time, about 4-5 minutes. 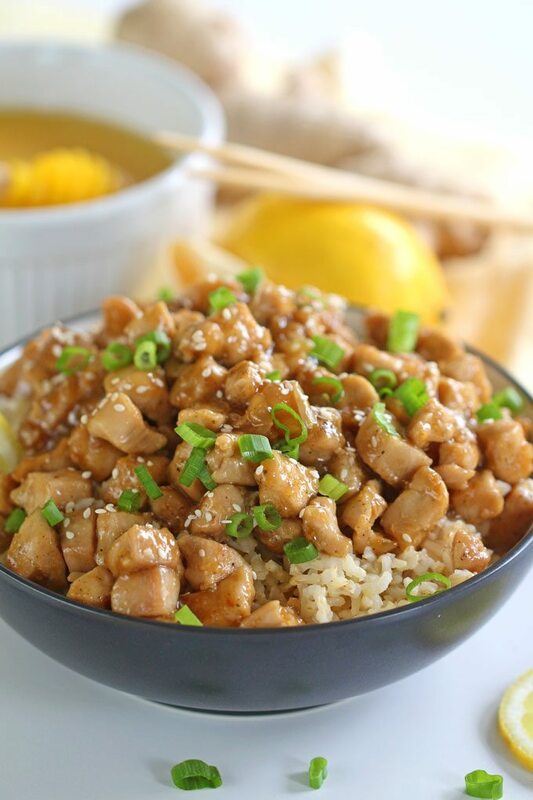 Serve chicken over brown rice, drizzle with a little more honey lemon glaze. If desired, garnish with sesame seeds and chopped green onion. If you want the recipe to taste sweeter, you can add an extra 1/4 cup of honey. I might have to change up my menu for the rest of the week now! YUM! I love that this is so easy to make and healthy, too! I LOVE how easy and healthy this is!! The perfect meal!! Cooking truly is a way to connect with family and friends. I’m always reminded of my mum when I make certain dishes for my family. This chicken is something my boys would love! Food and cooking brings back memories better than an family photo album for me. Whenever I taste certain flavors I immediately remember watching my grandmother cook when I was a kid. Anyway, my family would love this chicken dish! Love that you made a healthier version! Looks awesome. Honey and lemon is such a winning combo! Yummy, have to try this for sure, thanks for the nice dish! I know what is for dinner tonight! Ha ha! I cannot wait to try this! 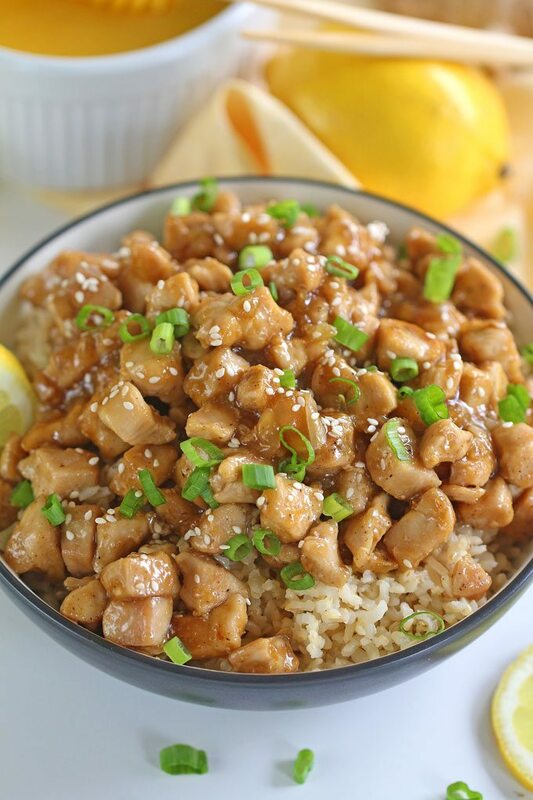 We love the honey lemon chicken from the Chinese place around here so this is definitely going to be a favorite! Yum, I love the bite-sized amounts of chicken. I’ll be making it this week for my family. I’m sure I could use Tamari in replace of Soy sauce. This sounds so good!! My family and I love Chinese food! I can no longer order it from my favorite place because I can’t have soy sauce. However, I can make this and use my gluten free soy sauce! I totally agree with you in regards to how high quality, fresh ingredients make so big a difference in a dish. In the herbs alone – the fresh garlic, ginger and lemon zest – I know you can tell the difference compared to dried or granulated versions. This dish also sounds very versatile. I see you have a version with lettuce wraps – I’d love that! Well thank you for planning tomorrows dinner for me! YUM! I cannot wait to give this recipe a try. I love that it is healthy and perfect for my family. 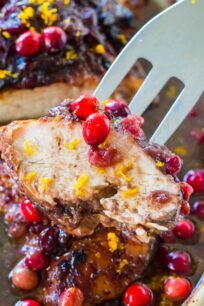 We love lemon chicken so i know we will enjoy this recipe too! 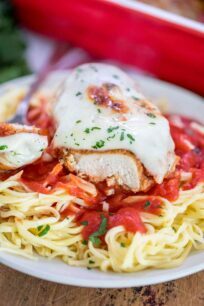 OMGoodness this dish looks so good! I love lemon chicken but, I’ve only had lemon honey chicken from a restaurant. Now you have my attention, I’m going to see about creating this for the family this week. It is such a healthy meal that we can enjoy anytime! Thank you so much for sharing this recipe! This sounds really yummy. My family would really enjoy this recipe. I wish I had seen it yesterday – we had a chicken dish for dinner and could have tried this instead. Yum. Both my husband and I like lemon and this meal looks absolutely wonderful. Plus, I have everything on hand, including fresh parsley from my little herb garden on the kitchen windowsill. The only thing I added were some capers. 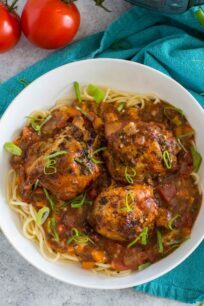 Such a wonderful recipe, not just for weeknights at home, but to serve to guests as well. Oh my goodness, you had me at honey. 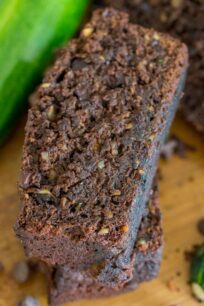 This looks so good and it even looks so easy to prepare! Thank you for sharing this. I’ll be trying my hands on it!